I have updated our photo archive with four high quality images of Hugh Dancy posing for the 2017 Hulu TCA portraits. I have added three high quality additions to the album ‘Unknown 015’ in our photo archive. I have added five high quality outtakes of Hugh from the Essential Homme photoshoot to our photo archive. I have updated the gallery with the portrait versions of Hugh’s photo session with Essential Homme back in 2015. In the album, there is an outtake that had not been featured in the digital edition of the magazine. I have included that below. Click on the image to go to the album. Cal, your character, is the charismatic leader of a religious movement, called Meyerism, which has been described as cultlike. Do you see it that way? Honestly, at this point I no longer distinguish. I think it’s really true that my cult is your religion. What was the first part you ever landed? I was 13 and at this very British school, the kind of school where someone could just come up to you and say, “We’re doing The Tempest next year, and you’re going to be Ariel.” And you would have to say, “Ah, okay…” I didn’t realize at the time I was taking any sort of plunge. Professionally, my first role was in a TV miniseries called Trial and Retribution. I played the acolyte to a serial killer—and I then spent several years after that doing costume dramas, which some would say was more what I was destined for. I’ve had to claw my way back to playing a serial killer’s acolyte. Dancy wears a Dior Homme shirt. Grooming by Lauren Kaye Cohen at Tracey Mattingly. I have added five portraits of Hugh from a photo session with TheWrap. You can view the original article here. And the photos by clicking on the thumbnails to go to the album. Hugh Dancy‘s character on Hulu’s “The Path” is so magnetic that even the actor who portrays him couldn’t resist falling under his spell. 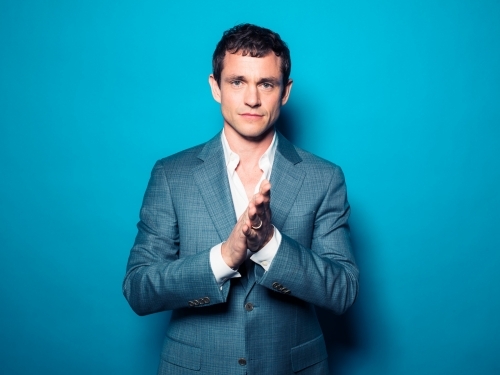 On the Hulu original drama, Dancy plays Cal Roberts, the charismatic cult leader of the Meyerist movement. Fans of the series saw him as a villain, but that was a reception Dancy hadn’t predicted while shaping the character and filming the series. The series, from creator Jessica Goldberg and executive producer Jason Katims, also stars “Breaking Bad’s” Aaron Paul and “True Detective” alum Michelle Monaghan as a couple who begin to question their faith and loyalty to Dancy’s reckless leader. To capture the atmosphere of a real cult, “The Path” films on a real religious compound just outside of New York. The scenic location goes a long way in setting the tone of the show, Dancy explained. I have added two portraits of Hugh from The Contenders Emmys to our photo archive. I have added high quality images of Hugh’s photoshoot with LA Times for The Path promotion to our photo archive. Also, for those wondering about “The Path” episode 3 screen captures, they are coming later today. I’m giving a little time for those who haven’t seen it to watch and not be spoiled once they are posted.